A pendulum consists of a weight suspended on a rod, string or wire. When the weight or bob is moved and let go, the pendulum will swing back and forth in a regular periodic motion. The effect of gravity on the bob results in the periodic motion, and the length of the wire determines the frequency of its swing. A simple pendulum has a point mass bob and a string of negligible mass. A physical pendulum has a larger-sized bob and a string or rod of some mass. Equations for the simple pendulum are much easier than for a physical pendulum. Pendulums have been used in clocks for hundreds of years. Tthe Foucault Pendulum is another application. What are some properties of a simple pendulum? How are pendulums used in clocks? What is the Foucault Pendulum application? A simple pendulum consists of a rod or wire attached at a pivot point. On the other end of the rod is a weight or bob. When pulled to the side and let go, the bob will swing down due to the affect of gravity. Inertia will cause it to continue to move back and forth at a definite rate. The frequency of the pendulum is how many times it goes back and forth per second. The period of the pendulum is how long it takes for it to go back and forth one time. If f denotes the frequency, then the period is T = 1/f. In other words, if the frequency of a pendulum is 60 cycles per second (or 60 Hertz), then its period is 1/60 seconds. Likewise, if the period is 3 seconds, then the frequency is f = 1/T = 1/3 cycles per second or 0.33 Hz. The frequency of the pendulum is dependent on the length of the string or wire. The shorter the wire, the greater the frequency or how fast it goes back and forth. The frequency is independent of the amplitude of the swing, provided the initial angle is small. At larger angles, there is a slight change in the frequency. Also, the frequency is independent of the mass of the bob. In other words a pendulum with a heavy bob will move at the same rate as one with a lighter weight bob. But this only makes sense, since the acceleration of gravity on a falling object is independent of the mass of the object. The most common application of the pendulum is to use its regular motion to control the motion of the hands of a clock. This is still seen in the older grandfather clocks. A gear is attached to a weight. Every time the pendulum goes back and forth, it moves a rocker which allow the gear to move one notch. Gears are then used to move the hands of the clock. Newer versions of pendulum clocks use a spring to move the gear. But the pendulum still controls the rate of motion of the hands. The length of the pendulum can be adjusted slightly, if the clock is running too fast or slow. Another interesting application is called the Foucault Pendulum. This pendulum will demonstrate the Earth's rotation. 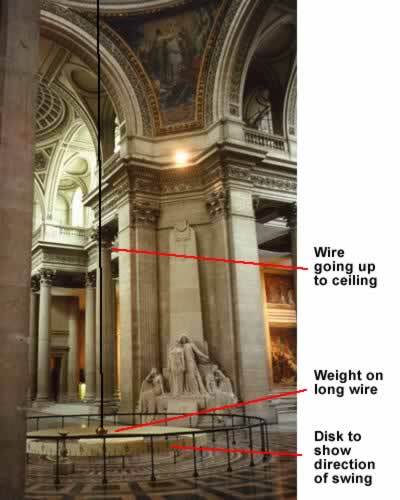 The Foucault Pendulum is a very large pendulum that is often several stories high. The reason it is so large is so that it will keep swinging over a longer period of time. Friction forces often damp a smaller pendulum and cause to finally stop after a relatively short time. In 1848, Jean Foucault discovered that when a large pendulum swings over a long period of time, the pendulum appears to be changing directions during the day. What is really happening is that the pendulum is moving in the same direction, but the Earth has rotated under the pendulum. Although there are now Foucault Pendulum's in many locations, the most famous Foucault Pendulum is at the Pantheon in Paris, France. The picture below shows the size of the pendulum and the scale at the bottom to indicate the positions at different times of the day. To explain how the Foucault Pendulum works, consider putting a pendulum exactly at the North Pole or South Pole. While the Earth rotated on its axis, the pendulum would continue to swing in the same direction in space. It would appear as if the pendulum was slowly changing directions, but in reality it is the Earth that is revolving underneath the pendulum. This same phenomenon will happen at locations other than the poles, except that the reason is not as obvious. A pendulum is a suspended weight that swings back and forth in a regular periodic motion. The length of the pendulum determines its frequency, while the weight of the bob does not affect the frequency. Pendulums have been used in clocks for hundreds of years, because the motion is so regular.